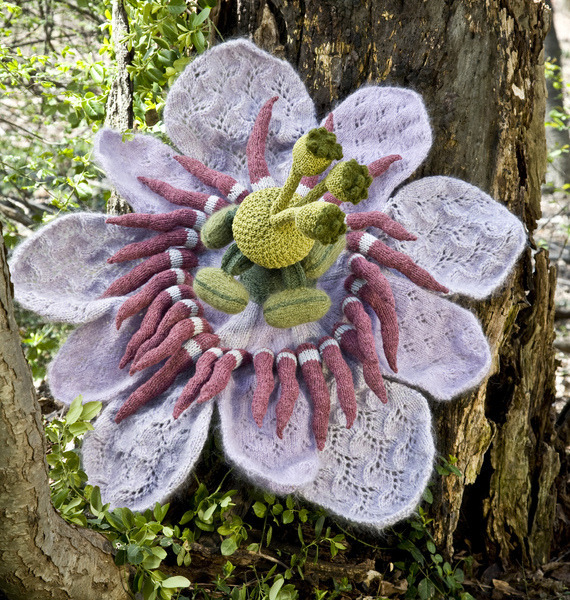 Today’s Inspiration Saturday post is coming to you from the world of art– handknit art, to be precise. Photo credit: Karen Philippi, from here. 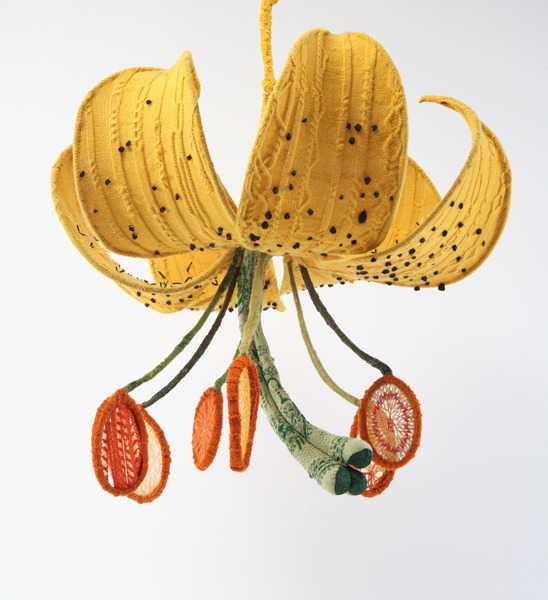 That is a gorgeous, gigantic sculpture entitled ‘Tiger Lily’ knitted and created by a local Rhode Island artist, Tatyana Yanishevsky. Isn’t it beautiful? I love the way the cables define the curved surface of the petals, they add such wonderful movement. Tatyana has an entire collection of knitted plants, all of which are incredibly detailed and anatomically correct, which really appeals to the biology geek in me. Photo credit: Megan Jones, from here. This one is ‘Anatomically Correct Passionflower’. Once again, I love the details on the petals: the lace patterning provides great texture and movement. It makes me feel like actual passionflowers should have lacy petals. 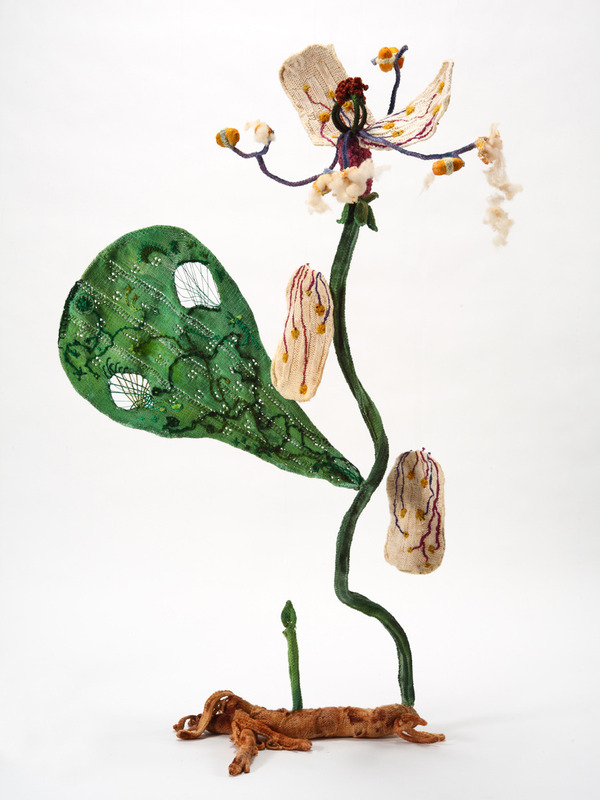 I also like the way the fuzzier, haloed nature of the petal yarn contrasts with the yarn used for the rest of the more solid, structural parts of the flower. And this picture is great for providing a sense of scale. This one, entitled ‘Letting Go’, is particularly awesome. It’s showing a flower in its senescence, slowly dying. I love the way the petals are falling, the holey bits in the leaf, as well as the tiny green shoot coming up from the rhizome, like the plant is getting ready to start again. I can’t see the details well enough to tell what’s going on with the knitting in this one but it has a lovely overall effect. Wanna know something else cool? The artist, Tatyana, works in my office! What are the odds of that, right? I encourage you to check out the rest of her work on her website, which includes a working knitted set of lungs as well as some interesting portrayals of sea life. What’s been inspiring you lately? Link along below and share! I dream of making that passionflower one day. My grandparents on both sides had passionflowers growing in their gardens and I've loved them since childhood. And how cool that you know the artist! These are amazing! thx for sharing!!! That is just stunning, I have never even heard of something like that. Thank you so much for sharing these!